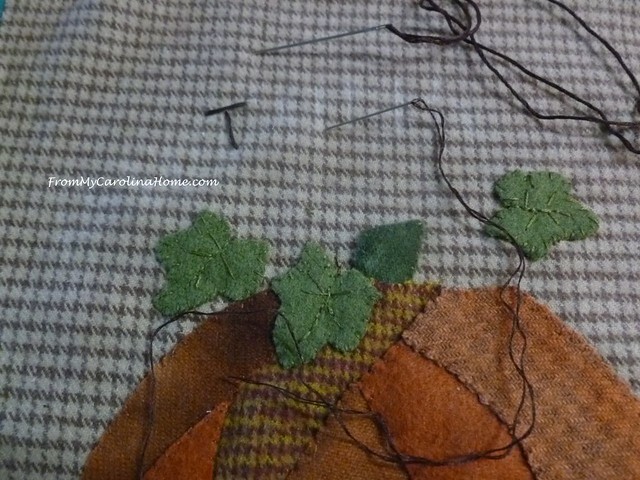 The Autumn Jubilee Wool Stitch Along will finish up today with the addition of embellishments and mounting. If you missed the first post with the pattern, click on Wool Stitch Along Part 1. 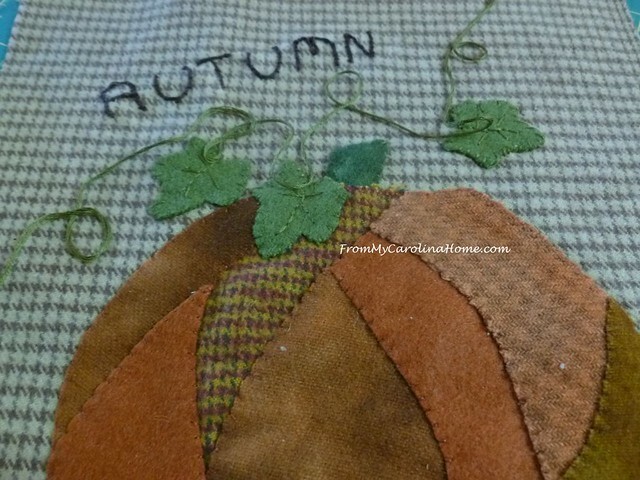 So, we left off with the pumpkin done and the leaves left to stitch. Place one leaf on top of the pumpkin, and the other two slightly above and to the sides. 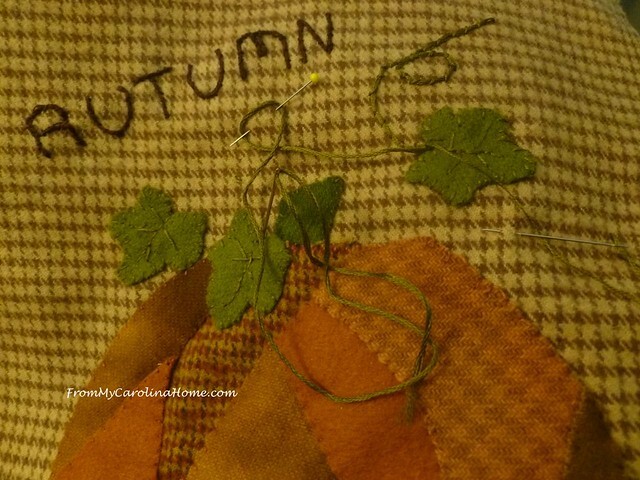 Using two strands of DMC floss, stitch the leaves in place. Stitch veins on the leaves for texture and definition. Gather some beads and buttons to play with. Over the top of the pumpkin and leaves, write the word ‘Autumn’ in chalk or erasable marker. 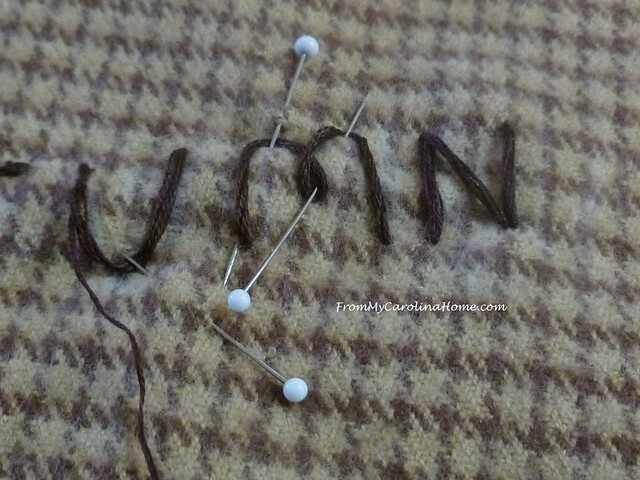 Beginning in the middle, stitch the letters using a couching technique. Using six strands of floss in one needle, come up at the base of the T, then down at the top, up at the end of the cross bar and down at the other to form the T. Repeat for the U and the A. 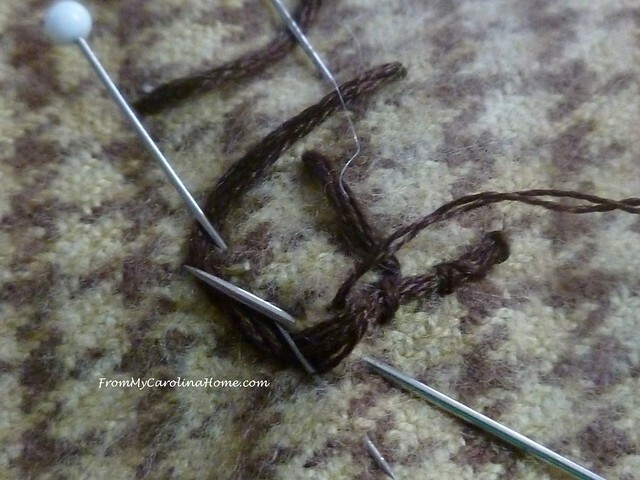 Then with a second needle threaded with two strands of floss, couch the six strands down. I like the way this technique gives smooth lines for lettering, heavy enough to be seen. Continue in the same manner for the other letters. For the M, I did a little twist to hold the floss in place. As you go, be sure to measure your letters (I used a seam gauge for a quick check) to be sure they come out the same size. Mine tend to get smaller as I go if I don’t keep track. Using the same couching technique, place a long piece of green six-strand floss around the leaves to create a vine, connecting the leaves and adding three loops. With a second needle threaded with two strands of the same green floss, couch the vine. 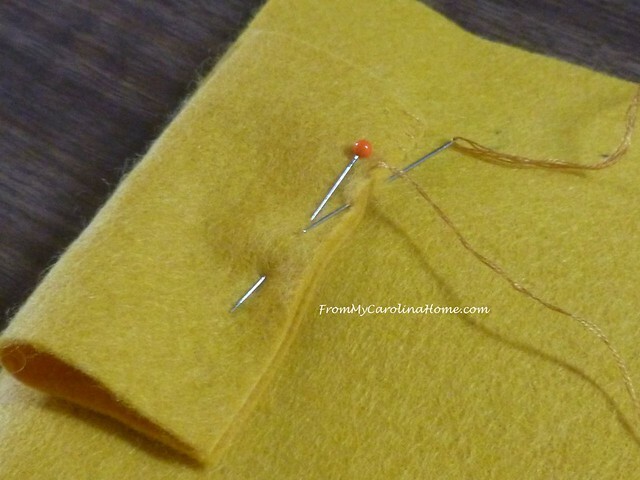 Use pins to keep the loops where you want them. The loops add just a bit more detail and whimsy. Add three buttons to the lower left of the pumpkin, and two to the upper right side next to the vine. 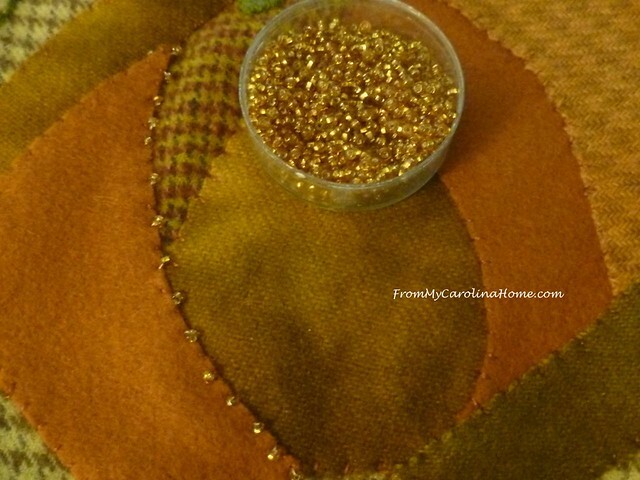 For added detail, using gold seed beads, sew 15 beads to the pumpkin along one of the seam lines. If you like, do two more lines of 15 beads each. This brings a bit of shine to the piece, adding more definition to the pumpkin. Square the finished piece to the size you want. I did 9-1/2 inches. On the back of the finished piece, iron on a fusible interfacing to add body to the piece and lock down the loose threads. Whip the top to a backing piece, mine is 11-inches square, giving a 1-1/2-inch border all around. If desired, add hanging loops. I made mine 3-inches square, folded in half. The frame doesn’t need this big of a loop, but I wanted the stitching to be behind the top piece so it wouldn’t show. All done, and hanging on my little table top stand. It is a nice addition for my Autumn decor. Later I can use it as a candle mat too. I hope you enjoyed this year’s Stitch Along for Autumn Jubilee. Today’s giveaway is a Sewing Machine Lighting Kit with Expansion set by Inspired LED!! Leave a comment on this post, then click on the button below to enter the drawing for an Inspired LED Sewing Lighting Kit with Expansion Module! Due to electrical differences between countries, this drawing is open to US residents only. Do you enjoy wool applique? Congratulations to Melanie T who won the Madam Sew Presser Foot Set!! i have not done wool applique. most of my quilts are applique. i love applique but i’ve never tried wool. i have a few wool applique patterns so i plan to try after i finish a few quilts i want to make. Just a lovely design and I love how you finished the pumpkin! I have lots of wool on hand, but have done very little. Looking forward to trying this. Thanks so much! That was a very good sew along and tutorial. I love the detail. I wish I had the time to make this one. Thank you! 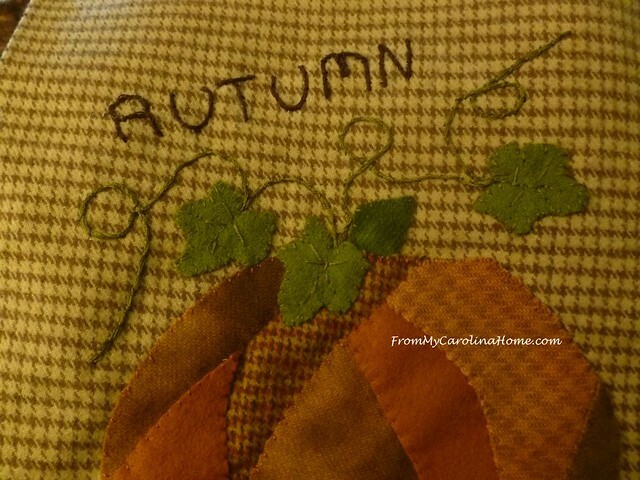 Autumn Jubilee patterns stay on the blog free forever, so come back anytime! Wool applique is new to me – but I came across a small supply of felted wool recently, & this project seems small enough to get done, yet large enough to get the feel of the technique. Who couldn’t use more light on their sewing machine??! As the years gallop by, I need it more & more. Sigh! What a sweet little hanging. You make it look easy. Your supplies must be bountiful! I have done some wool applique and want to do more. All the details, this project is wonderful. Stunning with the bead work, really makes it pop. 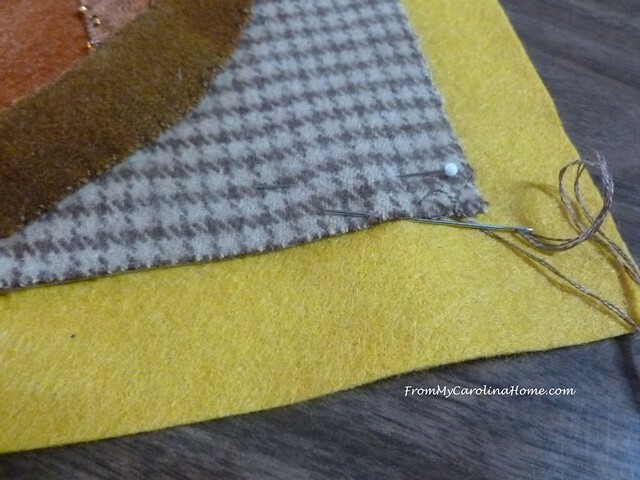 Great tutorial for the embellishments! This is lovely, especially in your cute wire hanger! Yes, this turned out really cute, especially with the buttons and beads. Have only done one project in wool, years ago and have been pulling things in the sewing room to see if I have the supplies on hand. Maybe…in the next few weeks after the blocks get sewn! 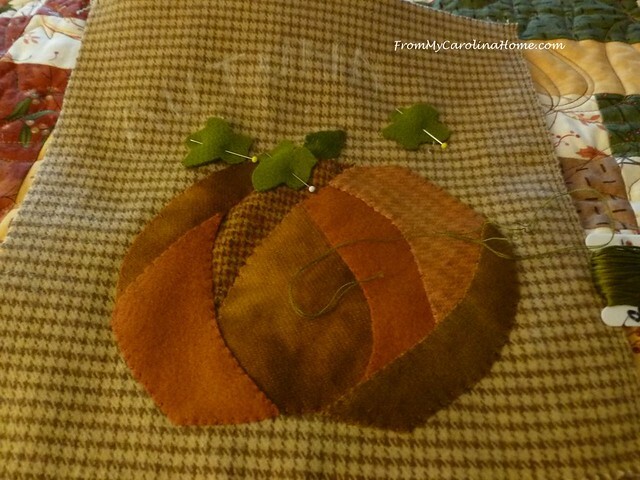 Thanks for sharing this wool pumpkin pattern with us. It is fantastic. I’m not much of an applique person, I’m still mastering machine sewing but applique is on my list of things to try in the future. In fact, I have whole pile of wool waiting for me. 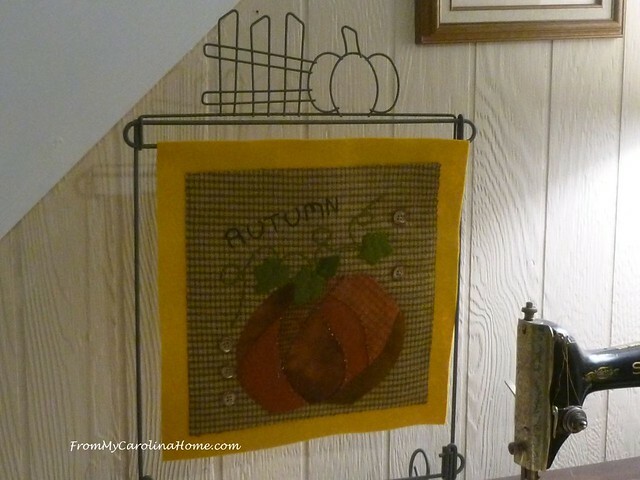 Love those little racks for hanging seasonal items. Your wool piece is lovely. oops, take me off the list as I am not in the US. However, in Canada we do use the same kind of electrical plugs as in the US.. Sure makes it easier for travel. Thanks for your generosity in organizing this event. I do enjoy some wool applique. I’m sorry, but the manufacturer puts the restriction on where they will ship. I’ll check the entries on Rafflecopter when I go to do the random winner drawing. Thanks. What a fun project. Thanks for the chance to win. Thank you for the Autumn project. Such a fun time of year to decorate and I will be making this project. How could I not. 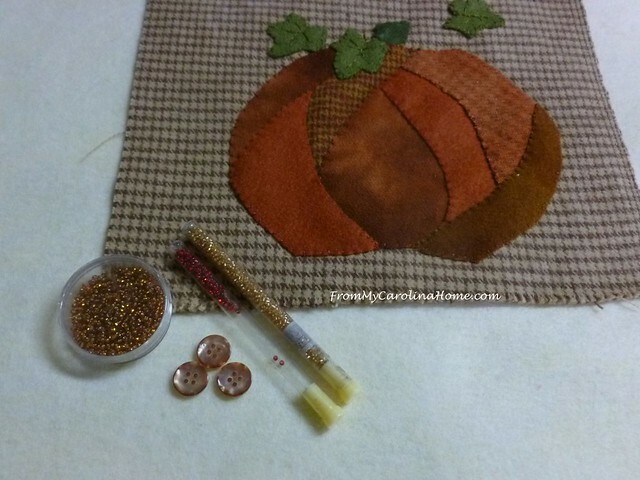 Wool applique/ autumn colors/ button/ beads. All the things I enjoy working with. Thanks for the opportunity to win the sewing machine light. 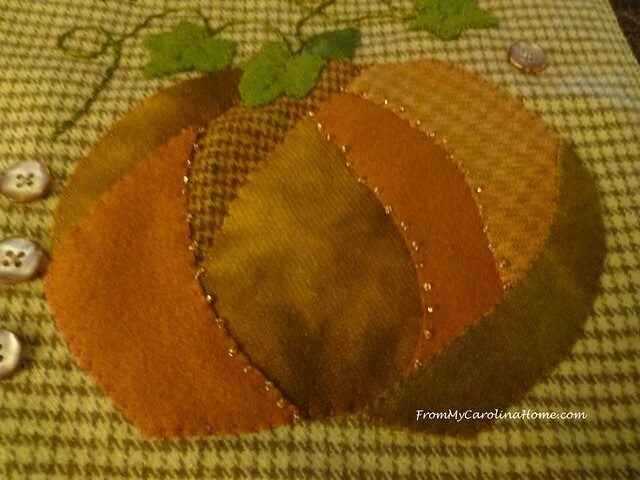 I love your pumpkin and all the fabric choices and finishing stitches. The table top stand is perfect for displaying the block. I have done wool applique and made a wall hanging and then a quilt with wool and included applique. Love this project! As a new subscriber to your blog, I’m looking forward to trying new things. 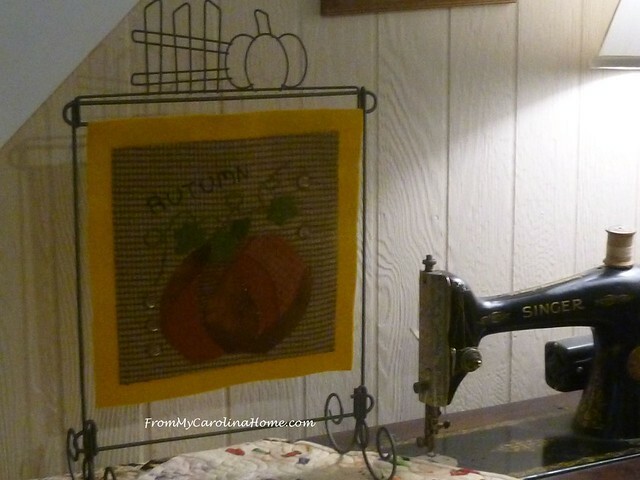 A really cute project, and a good addition to fall decorations! I have never done wool embroidery, but I have done lots of other kinds of embroidery. Love autumn colors! What a cute project. Your work is beautiful! I have not done wool applique but do have a cute little owl kit I bought in TN that need to try and make for my granddaughter who is an owl-fanatic! Thanks for the inspiration and the giveaway! What a cute hanging. 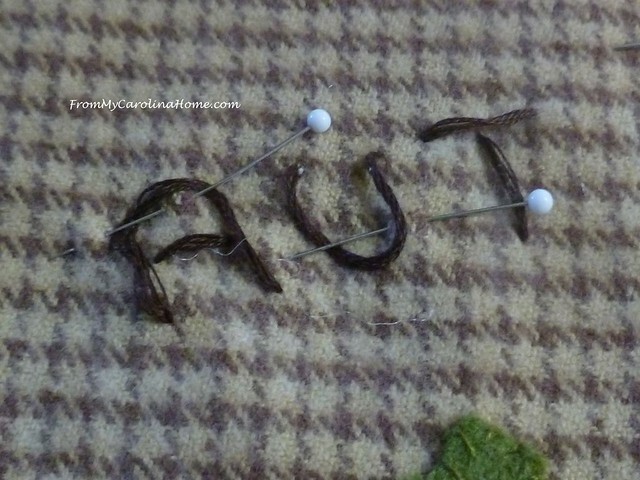 I have tried applique with cotton and like it but now will have to try this with wool. Darling Pumpkin! Thanks for sharing the great giveaway too! Your pumpkin is so cute and the buttons and beads are perfect finishing touches. Thanks for a fun sew along that I’m going to try for my first wool applique. I have never tried wool applique. But to love the look of wool work. Your pumpkin is really cute and I love the glitz the beads add!! Thanks for the pattern! I haven’t done any wool application but this looks pretty. I enjoy machine appliqué, but haven’t tried wool. 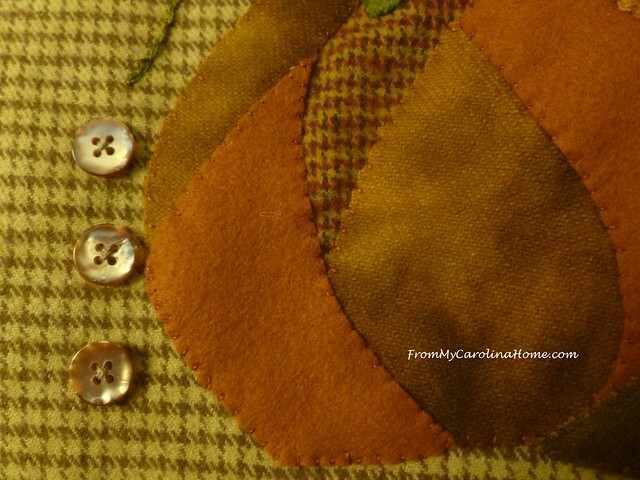 Your autumn piece is adorable though, and I love the details. Thanks so much, I love pumpkins! 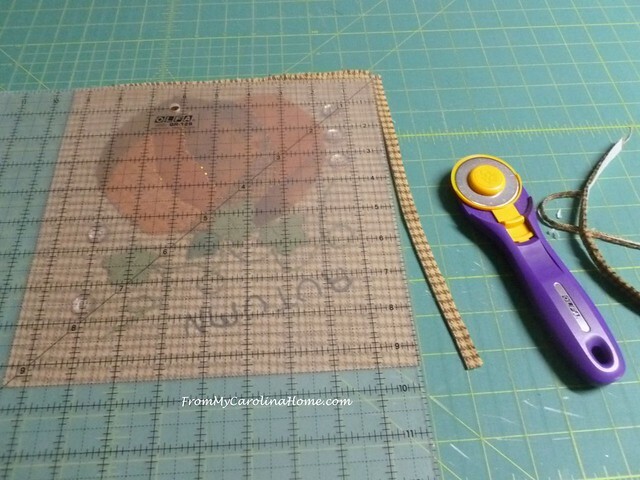 That is such a sweet and quick project, Carole, and the beads are a nice bit of whimsy too! I have been collecting wool garments in the thrift shop for felting and recycling–this would be a good project to try it out! Ha! I didn’t pay much attention when you started this darling wool pumpkin but now, WOW. home I will check out what I have. I am trying it for the first time.It is enjoyable so far. New skills are invigorating. I have not done Wool applique. I have however done wool felt applique and enjoyed that. That is a sweet pumpkin. It looks like a fun project to do. I have not tried wool applique, but this project is inspiring me! I have several pieces of wool in my stash and will look at the fabric in a different light now. Thanks for presenting a beautiful homespun piece. I have not tried wool applique but am interested in trying it. I think I will use it for some Christmas gifts. The beads work extremely well on the wool. Lovely finish! I have never done wool applique. Your pumpkin mini is so cute though. It sure looks like a fun project! I really like this design! I probably won’t make it in wool, (no oranges) but I appreciate that pumpkin and the seams that can be embellished. I have never worked with wool, but I like the look of this type of project. Very creative! Love the embellishments you added with the beads and buttons. Thanks for showing how couching is done! I have never done a wool project but do love the look! I am amazed how the sparkly beads look great on a folky project! So lovely… the beads are my favourite part! I love your pumpkin! 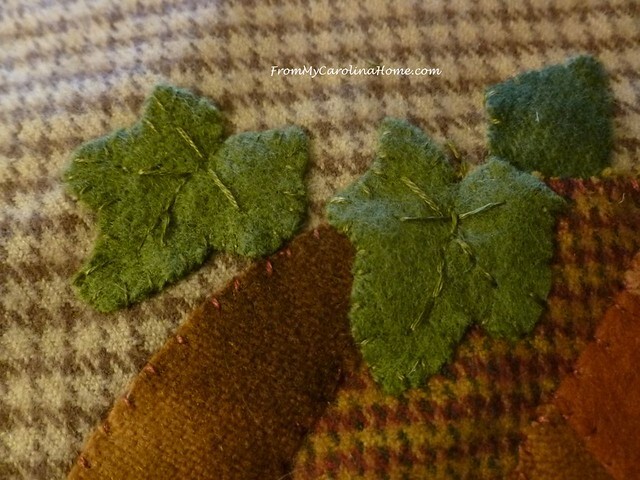 I have never tried wool applique but think it would be fun to learn this technique!